Home page for www.startyourownbar.com The Bar Owner Basic Training Series of guides and manuals written and presented by Clint Newsom. Have you ever dreamed of owning your own bar? Have you dreamed of being your own boss? Being in charge of your own future? Becoming the master of your own destiny? People from all walks of life have had the same dream. But up until now, there was no place to go to learn how to open your own bar, or even how to get started. But now there is a place to go. A place where beginners can find the guidance they need to develop the confidence to get started. With the resources being offered to you here, there’s never been a better time to get started than now. If you are interested in a business that welcomes creativity, rewards innovation, and offers a path to financial independence, the bar business, while not for everyone, is a great way to achieve those desires. Starting your own bar can be an exciting adventure, but it can also be very frustrating if you are not adequately prepared. The aspiring bar owner with little or no experience simply has no way of knowing the sheer number of challenges he or she will face on their way to getting open. The challenges of staying open are no less daunting. With the guidance you find on this web-site, you’ll be able to meet and overcome those challenges. Making the decision to go into a new business should not be taken lightly. You’ll never go wrong or regret having as much information as possible before jumping in. Just knowing what’s in front of you can help reduce unwelcome and unwanted surprises that can cost time and money you may not have. The manuals and other information on this web-site will give you the basic, no nonsense information you need to get started on a sound footing in the bar business. Virtually every aspect of opening and managing a bar is discussed. You would be wise to at least consider what is being offered. Please take your time and explore this web-site. If you have always wanted to start your own bar, you’ll be glad you did. Below is a short biography for you to get to know Clint. Clint was born with the bar gene. His great grandfather was a long time bar owner in the days before prohibition. In 1967 Clint got his first job in the hospitality business as a soda jerk at what was the first and largest Baskin-Robbins in Texas. Little did he know, that skills learned in that job, would prepare him to transition effortlessly into a bar tending job in 1972. At this job, Clint also learned to wait tables and eventually rose to the position of manager. Like most managers, he thought he was much smarter than the owners, and so he started to plan his own business. Clint realized his dream of opening his own bar and restaurant, with the help of a financial backer, in 1976 at the tender age of 25. It was in this business that Clint got his first lesson in the perils of financial backers, among many other rude awakenings. Later, Clint went on to own multiple bars and restaurants (often at the same time) of many types and concepts. It was during this period that Clint learned the perils of owning different types of establishments at one time. In a wonderful 30 year career in the bar business, Clint has experienced both success and failure. This has been the result of both good and bad decisions. The bad decisions have been the most educational. By learning from those painful mistakes, Clint has learned how to avoid them and thus make success more likely. Clint has learned there is never a guarantee of success in the bar business, and success is not merely avoiding mistakes, but is more likely when you avoid those mistakes. Friends convinced Clint that, due to the life he has led, he had a rare opportunity to help people who dream of being in the bar business. He is now doing what he was born to do, helping people by sharing his own experience. By teaching beginners exactly what is involved in opening their own bar, Clint hopes to help them get started on the right path to success. 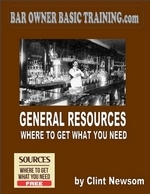 "Start Your Own Bar Manual"
Clint Newsom's MY OWN BAR series of helpful training manuals and guides to assist prospective new bar entrepreneurs (or new small business owners) to anticipate and avoid some of the challenges associated with new bar ownership. ALREADY Know What It Is You Need? Click the Resource Below to Link directly to that Manual. Any Questions? Ask us here.